Here are some creative methods to teach ABC that will be interesting for both parent and child. Make alphabets soup from alphabet pasta and before the kids consume it, use this to teach them the abc. Alternatively, you can use alphabet biscuits for the lesson. Your kid will enjoy learning abc and eating them as well ! Use alphabets as decor around the house especially at your child's play area or bedroom. Not only are they decorative but they also becomes a great tool in teaching abc for kid. Hand-painted or stencilled lettering can be applied to all kinds of things. You can start by putting your child's name on the door followed by labelling drawers with their contents etc. You can even have alphabets for pictures and frames. You can find many versions of alphabets songs here. You can also teach the alphabets by playing ABC scavenger hunt. Have the child hunt for items that starts with the desired letter. Use an alphabet stamp to learn the letters of the alphabet as well as coming out with new words and sentences in this alphabet activity. You can play lots of games with these blocks such as making new words, unscrambling words, sorting the consonants and vowels. You can also set up two little basket and have the child pitch the vowels into one and the consonants into another. 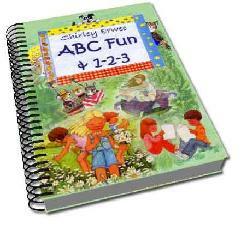 ABC Home Preschool now offers five subject 9-month Preschool Curriculums on CD. They have individual Preschool Curriculums for 2 year olds, 3 year olds, and 4 thru 6 year olds.